Clementine Art offers safe and natural art supplies for kids: soy crayons, soy crayon rocks, markers, paint, modeling dough and glue. all made with safe, natural, non-toxic ingredients. Perfect for little budding green artists. The holidays are coming fast and I’m on the look out for fabulous stocking stuffers and gifts for my kids. They always need new art supplies so when I came across Clementine Art I was intrigued. It’s great to find new green companies that cater to kids. My little guy loves the soy crayon rocks. They are easy for him to hold and use without breaking. 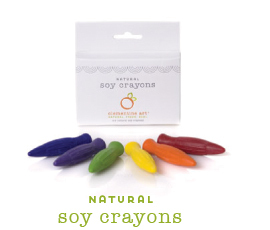 The soy crayons have a unique shape that is a perfect fit for little hands to hold easily. 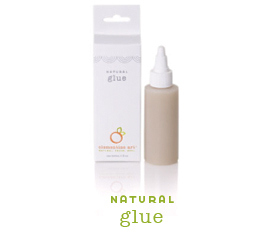 I can’t wait to try out some of their other products like the natural finger paints. The natural modeling dough is simply made from flour, water, salt, soybean oil, cream of tartar, natural colors (tumeric, annato, and spinach), potassium sorbate and citric acid. 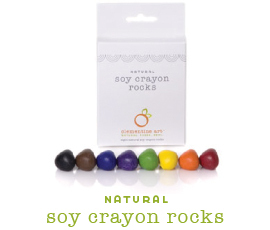 The soy crayons and crayon rocks contain kosher soy wax, mineral pigments, beeswax, carnauba wax, vegetable stearic acid, calcium carbonate (chalk), natural Brazilian rosin and titanium dioxide. Their other products are made with other similar, all natural ingredients plus they offer full disclosure of what their products contain. Clementine Art products are currently available at Whole Foods Markets. I hope soon that they will also have an online store or be available at other green stores online. I think I’ve seen the crayons before, but I’ve never seen the natural glue. And I had no idea Whole Foods carried these products! I will definitely check them out. Thanks! We’ve also got paint, modeling dough (colored with spinach and turmeric), markers and crayon sticks! Check ’em out! These are great crayons but I love the Stockmar brand! I’ve bought both of them in the past from a little mom ran online toy store called http://www.atoygarden.com She has a lot of wonderful natural toys too. My daughters favorite dolls came from there. They are weighted to feel like real babies. They are called Sweetpeas.